Today’s Friday photo is of Moorpool Estate, in Harborne, but more specifically of the wonderful bowling green, one of the estate’s many green spaces. For those of you who haven’t heard of Moorpool Estate, it is a little oasis in the city which I only discovered this year after speaking to a colleague and friend. 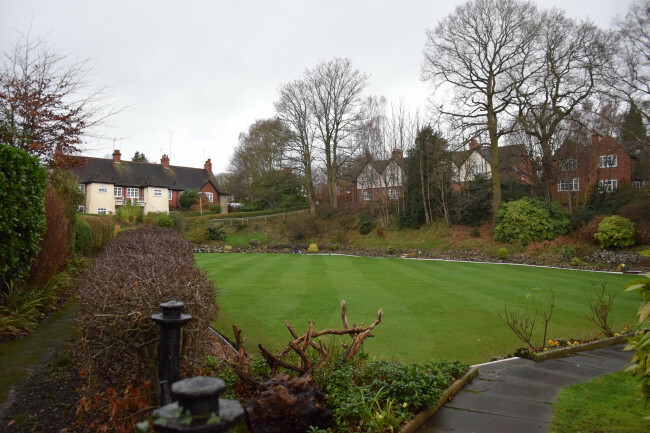 The estate was founded by John Nettlefold in 1907 and it was a much-needed and welcome addition to the city, with its many green spaces, and low-density housing, a direct change from the crowded back-to-back housing that filled central Birmingham during the 19th and 20th centuries. When I visited Moorpool last month for the first time, what struck me was the amount of open spaces such as parks and allotments, and I loved the ‘secret’ pathways that meander their way through the estate. It’s truly a hidden gem in the city, that’s well worth a visit. Thanks, Paul. This book sounds fascinating and I’ll definitely be hunting it down. I can see that it is also one of the city’s secrets because I only discovered it last year.